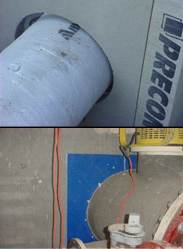 Part of the DryVault system includes our custom manufactured pipe entry seals. This system will save you time and money, and most importantly, provide a dry chamber... Guaranteed! The DryVault system comprises of a series of custom installed gaskets, water stops or injected resins to ensure the joint is 100% water-tight. Simply specify "to be sealed using the DryVault system, as installed by Island Basement Systems" and know that your structure will remain dry. Installed by experienced waterproofing technicians!